Issued by Mitsubishi HItachi Power Systems Americas, Inc.
Paul Browning, MHPS Americas President and CEO, and Miguel Saldana, Vice President of Gaz Energie, at the signing ceremony for the 515 MW natural gas power project scheduled to go commercial in 2021 in Peru. LIMA, PERU, July 19, 2018 /EINPresswire.com/ -- There is a Change in Power happening around the world as a combination of natural gas and renewables dominate new installation activity in the power generation sector. Nowhere is this more apparent than in Latin America. In the past 25 years, natural gas power generation saw an almost three-fold increase in its share of total power generation in the region, and it is projected to grow more than 150% in the next 25 years, according to the IEEJ Outlook 2018. At the same time, a new generation of advanced class gas turbines (ACGT) has emerged as the leading natural gas power generation technology around the world. Today, Mitsubishi Hitachi Power Systems (MHPS), the world’s leading provider of advanced class gas turbines, hosted a “Change in Power” natural gas power generation technical conference in Lima, Peru. Independent Power Producers (IPP’s) and other industry participants from across Latin America were on hand to discuss their experiences and showcase best practices on how to thrive in this dynamic power market. 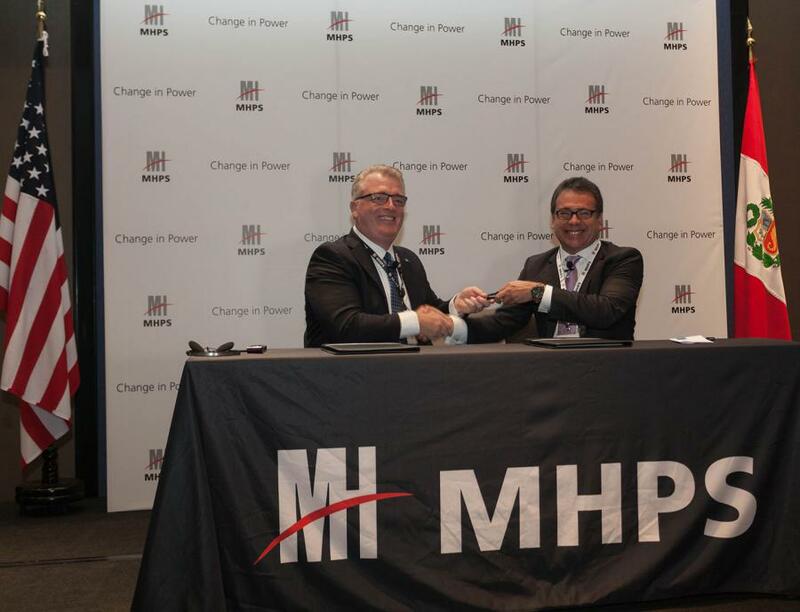 In addition, MHPS and local power developer Gaz Energie signed an agreement to develop a 515 MW natural gas power project that will have the lowest cost of electricity and the lowest emissions of any gas power plant in Peru. The Humay PS Project will be located in the Ica region of Peru and will leverage MHPS’ industry-leading JAC gas turbine power island, featuring the largest, most reliable and most fuel efficient gas turbine in the world. The new plant will enter commercial operation in 2021. “As we advance through project development, MHPS’ financial, technical and development support has assured our team that we have a long-term partner in Humay PS. Our next step is to formalize our EPC contractor selection, with whom MHPS has agreed to consort to deliver a true turnkey project for Peru,” said Miguel Saldana, Vice President of Gaz Energie. 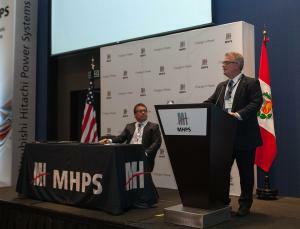 Paul Browning, MHPS Americas President and CEO, addressing the audience at the MHPS Technical Conference in Lima, Peru of the of the merits and benefits of the new project Gaz Energie power project. Mitsubishi Hitachi Power Systems (MHPS) is a joint venture company between Mitsubishi Heavy Industries, Ltd. and Hitachi, Ltd. integrating their operations in thermal power generation systems and other related businesses and is headquartered in Tokyo, Japan. MHPS manufactures the world’s most efficient Advanced Class Gas Turbines and is leading the development of the digital power plant of the future through its digital solutions platform MHPS-TOMONI™, providing real-time adaptive control and actionable knowledge to optimize power plant performance and significantly improve reliability. MHPS has an extensive network of manufacturing, service, remote monitoring and O&M support facilities located throughout the world. Headquartered in Lake Mary, FL, Mitsubishi Hitachi Power Systems Americas, Inc. (MHPS Americas) employs more than 2,000 people who design, build, install, monitor and service aero-derivative and heavy-duty natural gas, steam and geothermal turbines, generators, and environmental control systems throughout North and South America. MHPS Americas also collaborates with customers to deploy artificial intelligence and low carbon technologies to take the cost and carbon out of the electric power value chain. PW Power Systems (PWPS) and Mechanical Dynamics & Analysis (MD&A) are wholly owned subsidiaries of MHPS Americas.